Jacob Hanna/Pipe Dream Photographer Dana Stewart, an assistant professor of Italian and medieval studies at BU, is also a singer, guitarist and percussionist for local band Voodoo Highway, which performs covers of Grateful Dead songs. Stewart and the rest of Voodoo Highway performed a two-day concert series in the city of Binghamton this weekend. The Grateful Dead may be disbanded, but its fan base still stands strong. 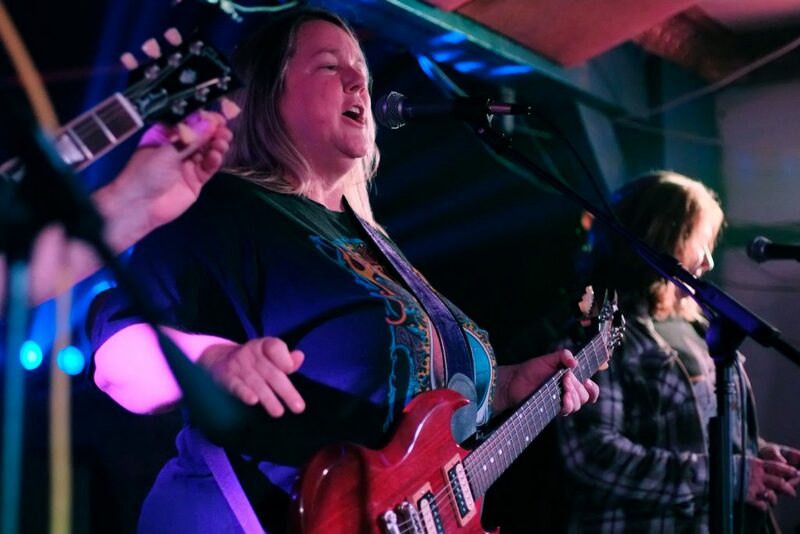 On Friday and Saturday night, the spirit of Jerry Garcia lived on through local band Voodoo Highway. With their two-night event, Voodoo Highway allowed audience members of all ages to live, and for some, relive, the Grateful Dead’s 1977 concert at the Floyd L. Maines Veterans Memorial Arena in honor of the concert’s 40th anniversary. Voodoo Highway began the weekend on Friday at 6 p.m. at the Binghamton University Downtown Center, with a performance sponsored by the University’s Division of Student Affairs. It continued on Saturday at 9 p.m. at Cyber Cafe West on the West Side of Binghamton. In the past, Cyber Cafe West has welcomed many acts ranging from student bands to local bands, including Voodoo Highway, who appeared comfortable and at home being in the familiar Binghamton cafe and concert venue. Crowd members mainly consisted of devoted Grateful Dead fans singing the decades-old lyrics along with the band. The audience reminisced as music played behind them, as if everyone already knew each other despite many meeting for only the first time. When the band asked how many crowd members were at the original concert on Nov. 6, 1977, a sizable amount raised their hands, showing the age range of the crowd from college students to people in their 50s and 60s. The audience members found common ground in their love for the music, however, and spent the night socializing, drinking and dancing. Voodoo Highway performed Grateful Dead hits such as “Friend of the Devil” and “Tennessee Jed,” all taken from the set list of the 1977 concert at the arena. The band strived to keep the set list and sound authentic to the original show. Stewart joked that even their mistakes were identical to those at the show. Though Voodoo Highway wanted to replicate the Grateful Dead’s show, they still managed to showcase their own unique skills and talents. They successfully paid homage to their predecessors while standing on their own as talented musicians and a distinct band. The band included Stewart as lead singer and on rhythm guitar, Bob Rynone on lead guitar, Andy Gorman on bass, Tom D’Angelo on drums, Curtis Kendrick on keyboard, Christine Barnaby as a back-up singer and special guest Rob Wenig on bass. Wenig is a former member of JGB, an outfit which grew out of the Jerry Garcia Band, an eponymous side project of the Grateful Dead’s lead singer. He flew out from California to play with Voodoo Highway and help put the show on. Keyboardist Kendrick, like Stewart, is a BU faculty member — he is the dean of libraries. Kendrick, a longtime Grateful Dead fan, saw the original show while a student at Brown University.